Disaster Restoration by Pate & Co. is your local professional source for disaster restoration and home repairs, including mold removal and water damage of all types. We offer 24-hour emergency service, as well as Free Consultation for mold removal and water damage restoration. Our certified, professional services are available throughout our Alabama service area, including Birmingham, Bessemer, Talladega, Helena, and close by. The folks of Disaster Restoration are top notch specialists - for EVERY area of your home. Prices are reasonable and their work is PROfessional. The personal attention to detail and humble men and women who work here are truly the best! We have used them for Mold Remediation and plan on using them for another big project his Spring. I would give them 10 stars! Thank you to Zac and "the gals" at your blessed company. At Disaster Restoration by Pate & Co., we offer certified, professional mold removal and disaster remediation services in the Alabama area, including Trussville, Pinson, Alabaster, Pell City, Montevallo, Gardendale, Pelham and the surrounding. Our experts are standing by to help you! 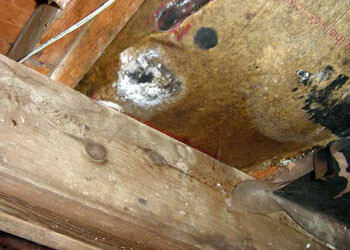 For a free quote for mold removal or remediation, call us at 1-855-233-6493 or send us an e-mail today!